2017 has been a great year for Inklingo and I hope 2018 will be even better. More videos. (And more video bloopers.) More shape collections. More sewing time. More QUILTS. And last but not least, more time with friends. Thank you to everyone who watched Friday Night LIVE. This would not be any fun without you. As usual, I was disappointed with parts of it. This is a rare shot where I was actually looking at the right camera. I was so concerned about making sure I was showing the intended scene/camera—correcting a previous mistake—that I was often looking at a monitor off to my right. It looks odd. Disappointing. So, next time, I will try to look at the correct camera more often—while still keeping an eye on what scene is playing and NOT glancing at the live feed on Facebook, which is delayed. All very confusing—but that’s LIVE for you. 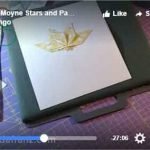 Unfortunately, this clip showing printing on dark fabric was cropped very tightly in Friday’s live video—my mistake. I was able to create this new clip (above) with the un-cropped original video and coordinate it with the audio from the LIVE video. (It’s a miracle. I amazed myself.) I’m still learning. I think I can avoid this mistake next time. 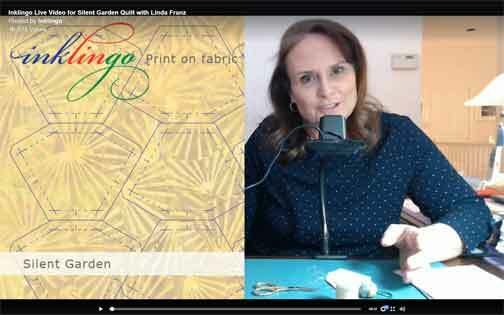 There is more about printing on fabric on the Main Beginner’s Page and more about printing on DARK fabric in the Top Ten Tutes. The close-up camera focus was disappointing AGAIN. I’ll try something else next time. I’ll keep making mistakes but I’ll try to make new ones every time, okay? Live = You never know what will happen but I still felt sad when I watched the replay this time. If you had trouble seeing the stitching, there is an olde Inklingo video on YouTube which shows Circling the Intersection. Yesterday, I tried to get over my disappointment by sewing 6 more stars. I’m limited by the amount of fabric to only 57 stars. I wish I had more. I have 19 of 57 finished, so I’m a third of the way there. It is going to be gorgeous, don’t you think? Thank you, Willyne Hammerstein! 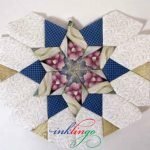 I combined hand and machine piecing (hybrid piecing) yesterday. Each star block goes very fast, especially when I’m not on camera, trying to talk and manage cameras at the same time. 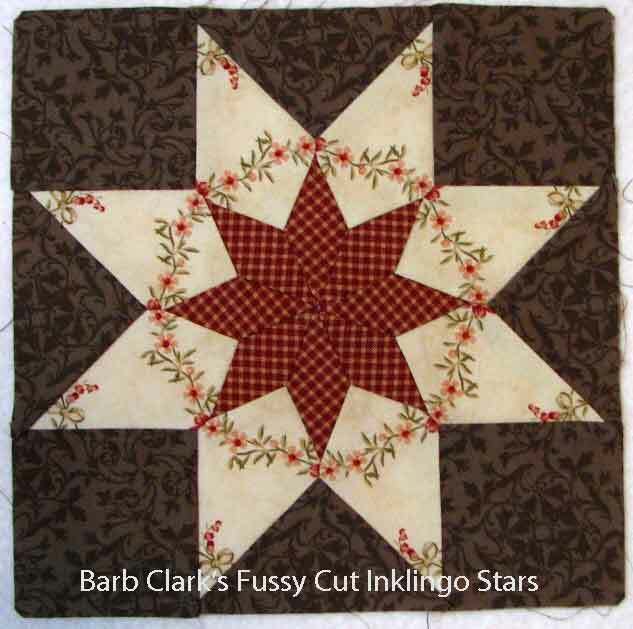 Driveway Barb’s Blog – Barb Clark teaches Inklingo in the Fort Worth area of Texas. 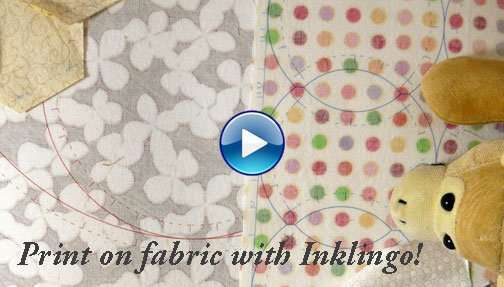 She has been using Inklingo for years and shows her amazing fussy cutting (above) on the blog. You can ask her why I call her Driveway Barb. 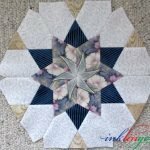 Cathi’s Quilt Obsession Blog – This is one of the blogs I have followed for years. Great inspiration! 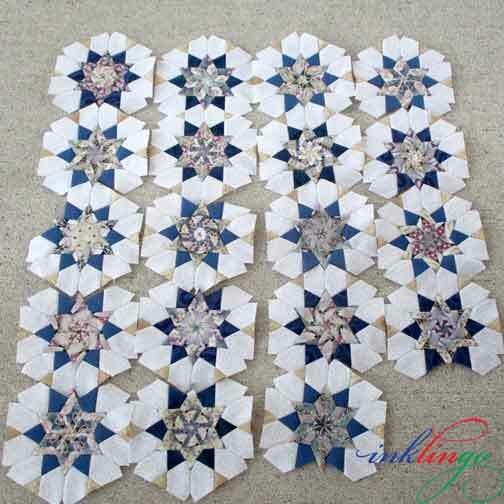 Cathi has made many quilts with Inklingo since 2006. Her latest article shows Silent Garden stars from the front AND from the back. There is always a fabulous cartoon by Mr Q O. Main Beginner’s Page (link from top right of every page on the website or in the Shop) There is a short, detailed VIDEO INTRO to Inklingo on that page. I can confidently say that we will have brand new mistakes in Live 04. <sigh> I am learning as we go along. It’s not boring. You never know what will happen. I’m trying to see it as a learning experience. Thank you for visiting here and thank you for watching LIVE, despite my shortcomings. If you missed it, I hope you will watch the replay (at top) with a kind eye. Don’t forget to order the shapes while they are only $20 too! This video only takes 8 minutes and tells you how to start FREE. 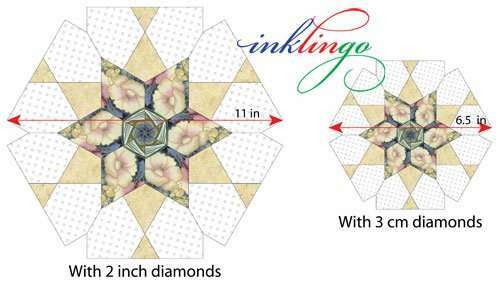 If have a New Year’s Resolution to learn something new, let me suggest learning how to print on fabric. I guarantee it is easier than learning how to do live video! I hope you will be back for more LIVE videos and bring your friends in 2018. Thank you for a great 2017. Happy New Year! Your sound was much better on the second video. Give yourself more credit. It is always a learning experience. You are doing fabulous and I love the information you are sharing with us. Thank you for all your time and effort. Thank you, Cindy. I am not a techie, so I got some help with the audio equipment. We think we know what went wrong with the audio in the 3rd video, so I will try something else in the next one. I appreciate your encouragement! Your stars are gorgeous, Barb. I hope you will share on your blog again this year. Happy New Year from COLD Canada! What fun to have the shout out from you in this post! Thanks! 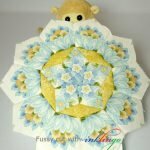 Fussy cutting is so very fun with Inkingo. I can’t wait to make more stars. Thanks for all you do to support my quilting addiction. Inklingo is awesome! Love your videos. How many ink cartridges does your printer have. Mine has two a black one and a color one. Yours seems to bring up so many color choices to print. Will mine do the same? Yes, it will work with your Inkjet ink, Cecile. I think you will be amazed when you try it. Please start with the FREE shape collection. I have also emailed you with more info but if you have questions, please ask. Thank you very much for your encouraging words, Linda. 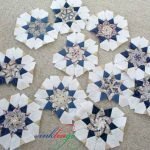 Your Millefiori Quilts book was mailed on Saturday in Niagara Falls NY, so it should be there on Tuesday or Wednesday at the latest. I think you will love it. Thank you, Whiskers! I’m glad you enjoyed it and that it prompted you to look at Millefiori 3 again. Happy New Year! 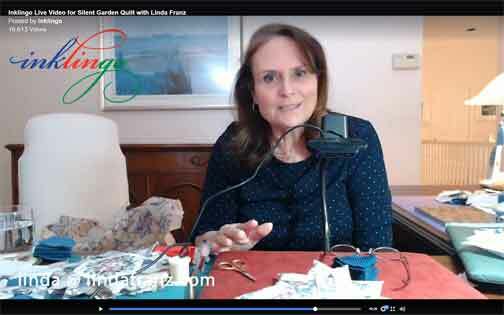 Linda, despite technical glitches, your information was spot on and I learned so much! That is the bigger goal and you hit it! Thank you and I can’t wait until I get the Millifiori book in the mail from you. Don’t be discouraged, you have done so much. Thank you! Just watched the rerun of the Friday night video. Firstly, reach up and give yourself a pat on the back. You are braver than I would be to video live with no out-takes. The cameras were a little out of focus and seemed to focus themselves automatically. I don’t know about those things, but some of the close ups were a little blurry. I’m sure you will get the hang of it soon. And the sound was a little hollow/echo-ey. Just beginner glitches. As you “go live” here at 4P on Friday, I did forget to catch you “in person”, but the archives are great for catching up. One thought that crossed my mind is to make the videos shorter and specific to one or two topics, instead of longer with more things to cover and fuss about. Just my 2 cents. I had the time earlier today to give more than a thumb-through of Willyene’s book. Oh! My! I want to make them all! There just aren’t enough hours in a day, week or month. Even though it is pretty much a one-sided conversation, it is truly great of you to make all the effort the videos no doubt require. Loved seeing the snow outside your home. We had some snow, but yesterday and the day before were monsoons and it is almost all gone (not that I’m crying). I just don’t enjoy driving in the snow. Now it is just cold. But certainly not like the mid-west is having. Snuggle up with your chef, and have a lovely New Year’s Eve and a joy-filled New Year. Linda, dear one! 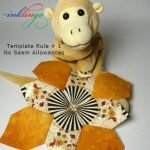 You’re such a quilter! We seem to feel obliged to point out our mistakes. No need. No need at all. You’re generous to share with us. Thank you and take it easy on yourself! Thank you, Dorothy. I had higher expectations for this video but if I wait for everything to be perfect, I would never do anything at all. Thank you for your kind words and for understanding a quilter so well!